You’re in for a wild ride. When you hang with Deadpool, you never know what’s going to happen. One second he’s cruise through the drive-thru of your favorite taco spot. The next second he’s fighting the zombie versions of the Presidents of the United States. Then, he’ll start a fight with Wolverine for no reason. Yeah, if you plan on riding with Deadpool, you’d better buckle up, baby. Well, now it’s easier than ever to buckle up with Deadpool, because this seatbelt buckle belt exists. This handy belt serves multiple functions. First of all, it keeps your pants from falling down. That’s a very important feature, since you don’t want any strange mishaps happening when you’re Deadpooling it up. Second, it satisfies your need for Marvel themed apparel, since it has Deadpool’s signature symbol decorating the exterior. Just slip it through your belt loops, give it a little click, and then you’ll be ready for anything! This belt works great as everyday wear, but you can also add it to your Deadpool cosplay outfit to tie the whole look together. 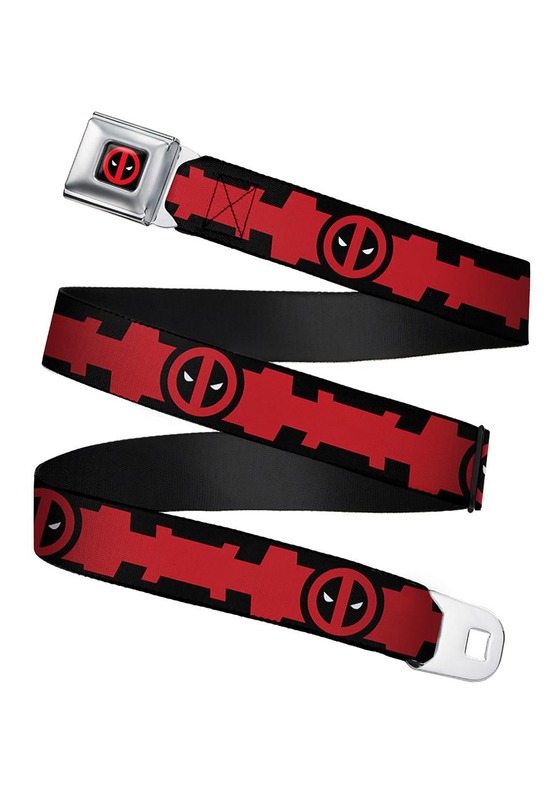 Just be sure to check out all our Deadpool accessories to customize your look!